PLAY is a sound installation in which old and new radio plays by members of the Akademie der Künste can be experienced acoustically in a non-radiophonic context. Radio plays – unlike compositions, theatre plays, readings, etc. – are often not repeated after their first broadcast and lie silent in the radio archives. 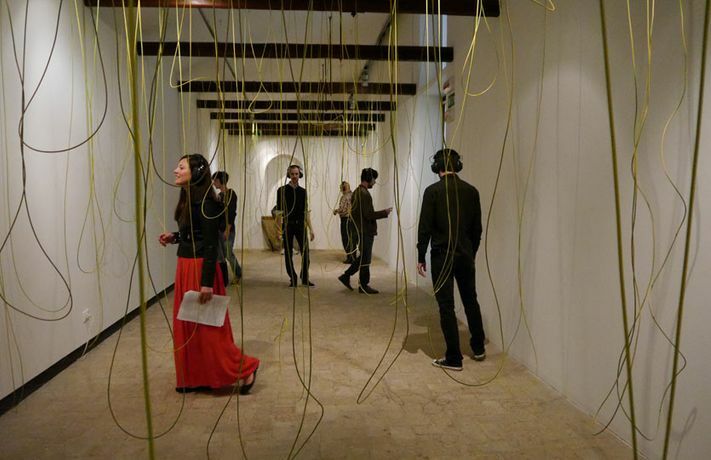 PLAY is a sound installation in which old and new radio plays by members of the Akademie der Künste can be experienced acoustically in a non-radiophonic context. In a room, there are loops of electrical cables hanging from the ceiling, filling the space, reminiscent of climbing plants. Each cable loop contains an excerpt from a radio play. Visitors are given special inductive headphones, enabling them to move freely between the cable fields. This allows them to discover ever-changing combinations of radio plays, either simultaneously or sequentially, and to put together individual "mixes". The sounds are transmitted using analogue electromagnetic induction technology. The room is silent; people move slowly between the cable loops, listening. The radio plays can only be experienced by putting on the headphones. You follow your own movement, as if through an ensemble of different pieces, all of which are being performed at the same time but can never be heard all together. The term radio play contains 'play'; playfully discovering and exploring many different radio plays becomes an individual listening experience for each visitor. The installation runs from 15 to 18 Nov 2018, on the days around the General Assembly.